We almost didn’t leave, but the forecast told us unequivocally that the winds would abate as the day wore on, and we knew the river was wide and the locks were large so the risk of hitting something was slight. Besides, we reasoned, if we tired of battling the elements there are a few little spots along the way that we could sneak into for overnight respite. In the event we almost enjoyed the challenge, managing without incident or danger to person or property and wondering exactly how worn the day would be before we saw some relief. Experience should have given us the answer:- There would no let up at all while we were moving, but a sudden and particularly vicious squall would come from nowhere at the time we were trying to moor. The wind direction would change in an instant to be exactly opposite any direction we would want to move. We’d get tied off in the middle of it all, blood pumping just a little above resting levels, and then not a moment later a deathly calm would descend and remain with us for the evening. If one were superstitious one could imagine strange forces at play to discourage visitors to this little port in which we've only ever been alone. 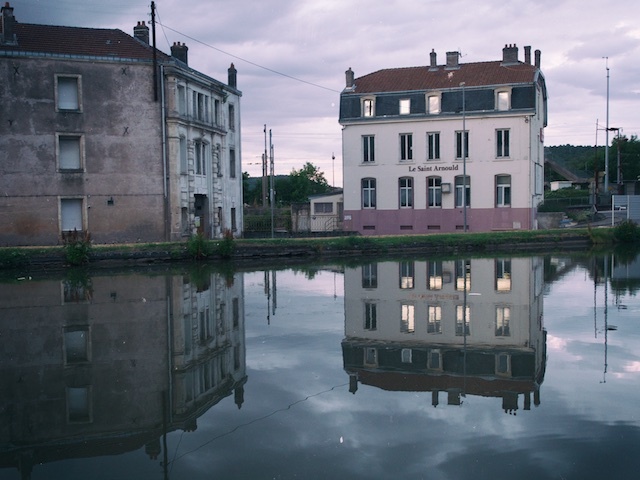 Perhaps one could concoct a tale about the ghosts of the Champignuelles waterfront living in the abandoned buildings opposite, warning off visitors, wanting to be left in peace. We pondered that for a time during the evening, and then we noticed the building’s reflection. Surely the illumination in the lower rooms were just a trick of the light. Surely. How did you do that??? Quite a reflection to top off a thoroughly nasty day.